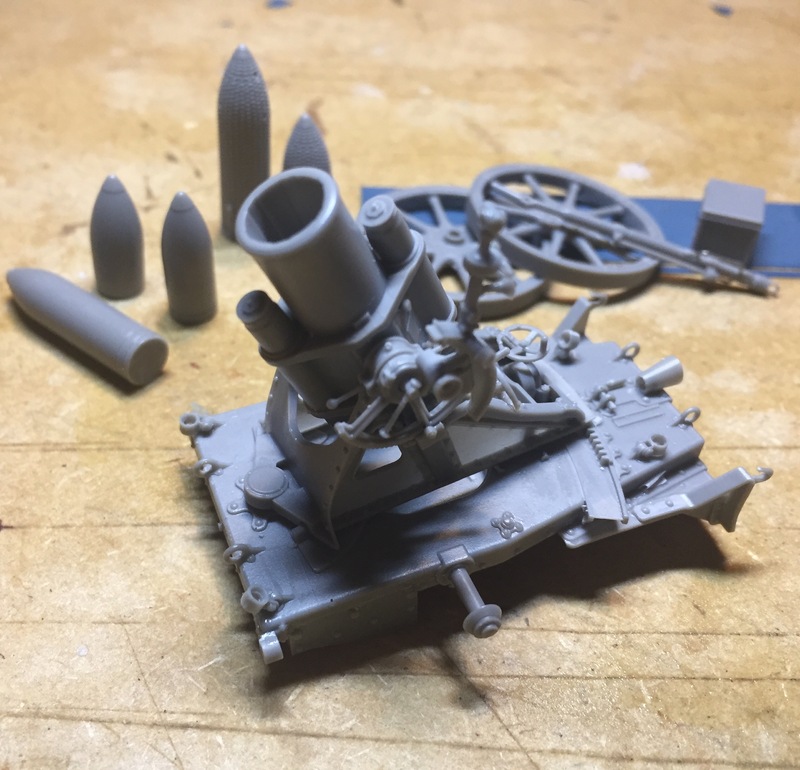 Some time ago I started this project and used the new CMK 25cm Minenwerfer which is wonderfully cast and full of pretty details. 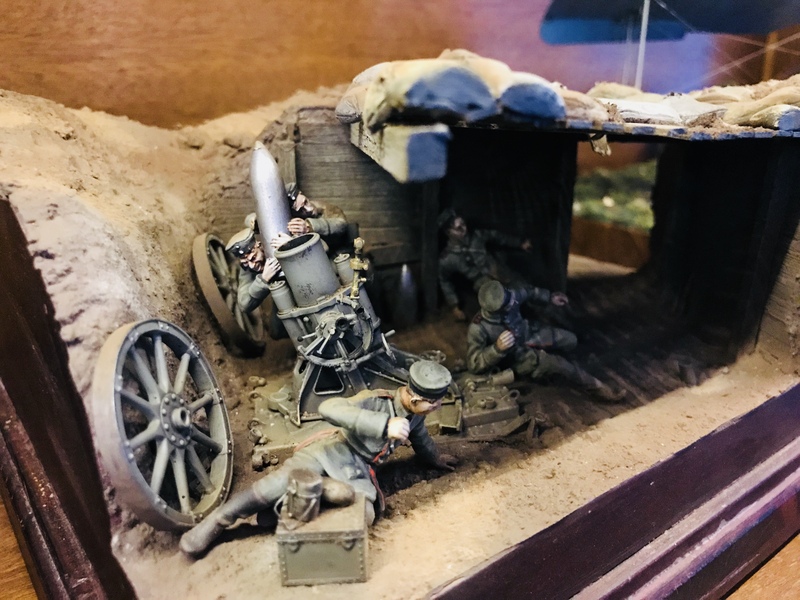 The Minenwerfers were rarely seen uncovered due to its short range which made it necessary to dig them in in the forward trenches and due to their smoke and flash when firing. So Minenwerfers received an overhead cover whenever possible - even when it only was some wooden sheets and some sandbags, as here. 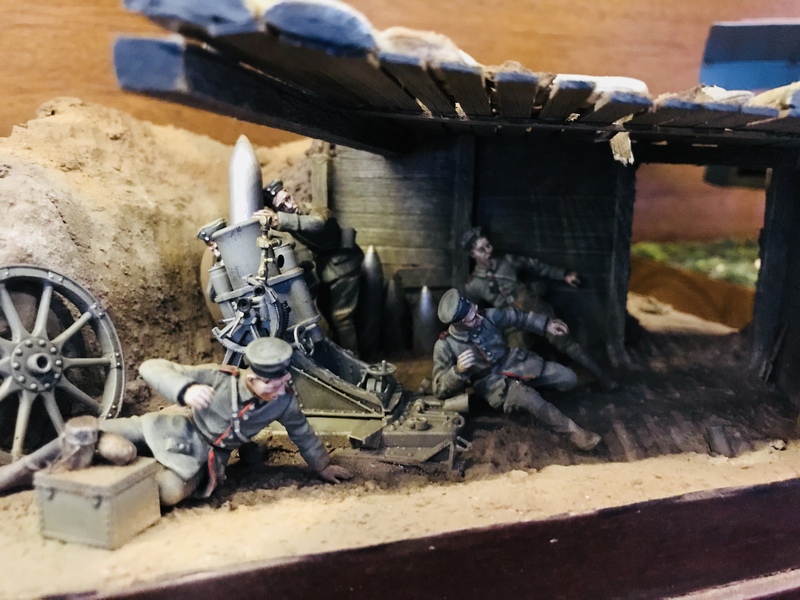 So the Minenwerfers were well within the radius of hostile counter shellfire and even smaller guns like the French 75mm gun or the British 18pdr were a dangerous threat for the Minenwerfer and their crews of about 5-6 pioneers. Such a scene I wanted to recreate. 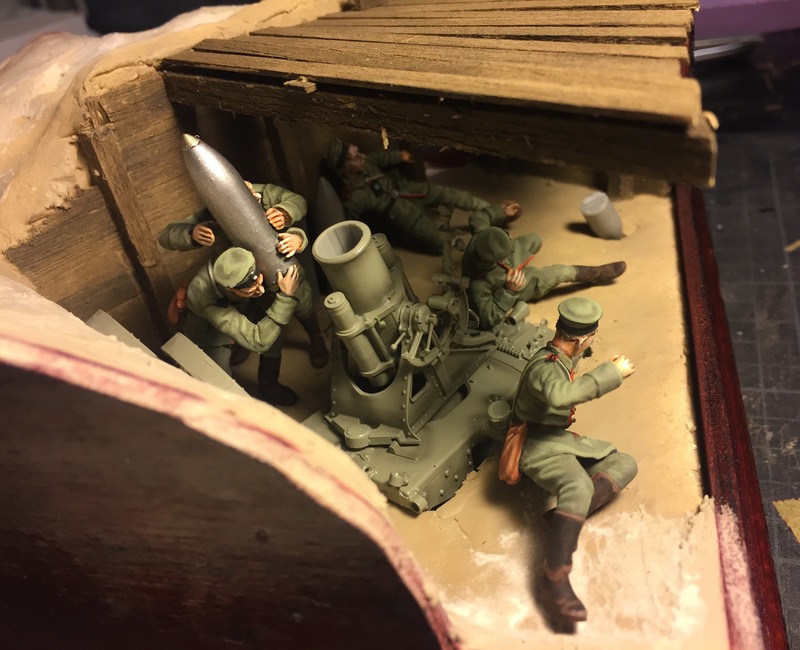 The hostile shell for now is replaced by a half mine and will soon be replaced by a French 75mm shell. Is it a blind shell? Does it have a retarded ignitor, or is it a gas shell? Here are some pics of the first stages of planning. 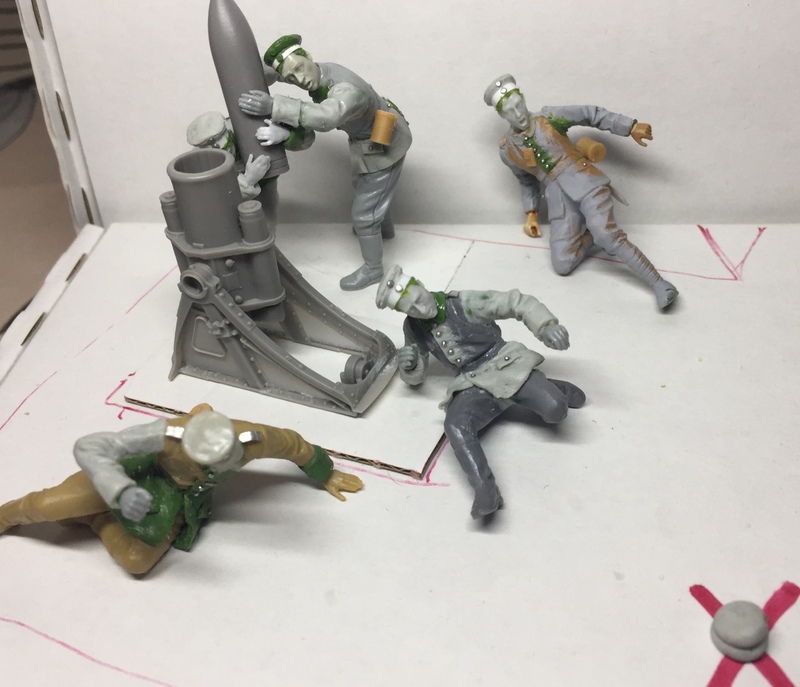 I used figures from several brands like Masterbox or ICM, which I heavily converted to look like a Minenwerfer crew under enemy fire. Outstanding Andreas, looks like a couple of the crew members will need new undergarments (if they survive). Magnificent work Andreas! That is very impressive and the figure conversion work is outstanding. Hammer, Andreas! 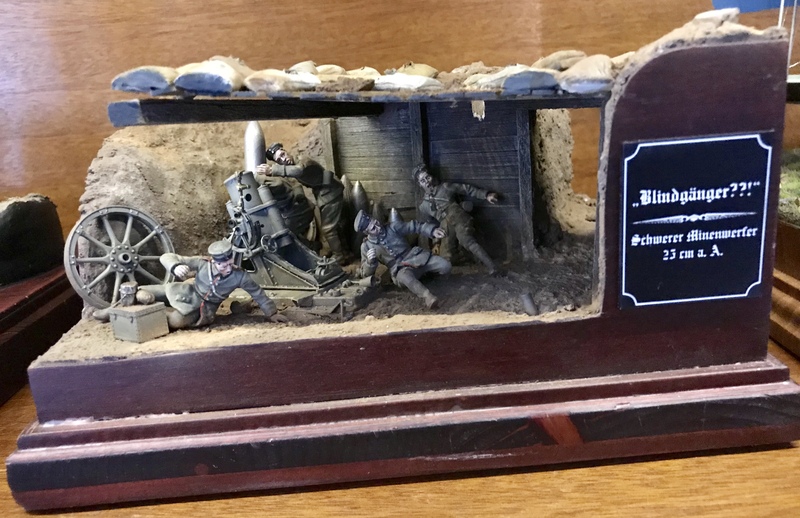 So many details, action and movement, the faces really reflect the terror of the unexploded bomb. Wow and double wow! Superb work. 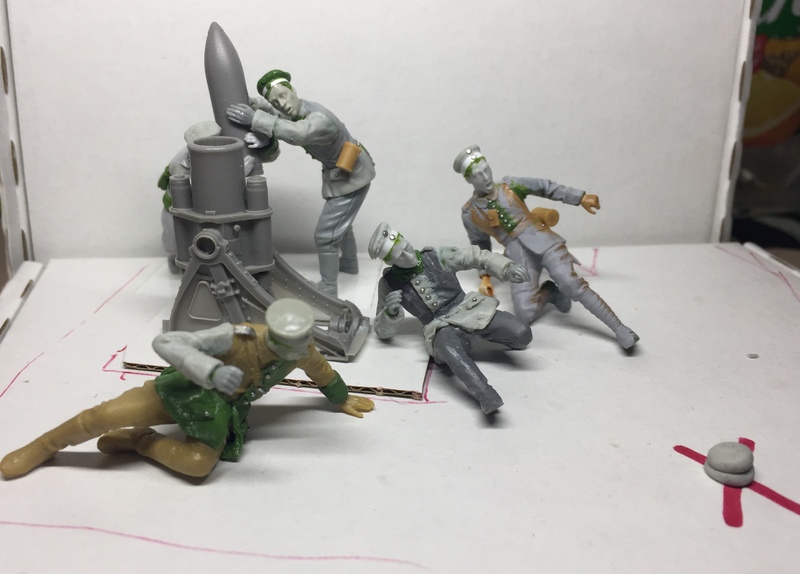 I really like the animation of the figures and the overall setting. 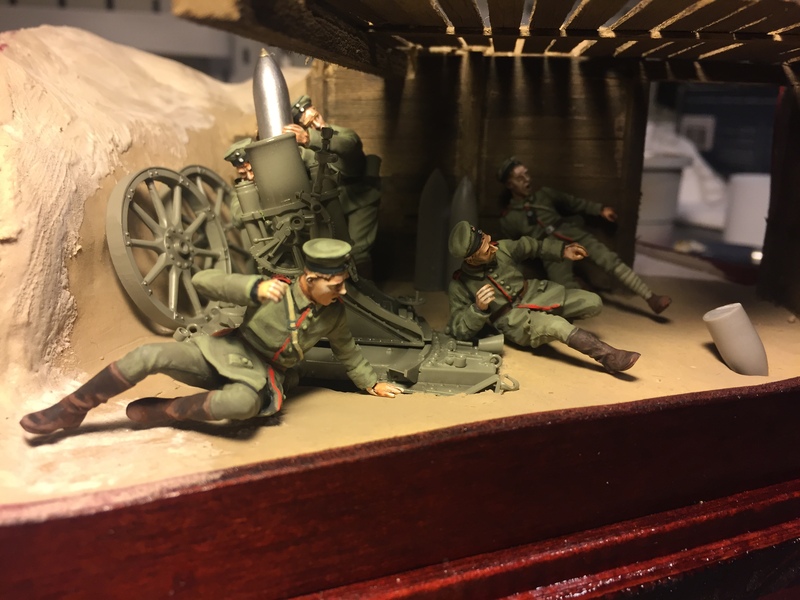 I'm trying hard to get my dioramas to "tell a story" rather than just be a group of figures on a base, and seeing how you do something like this is great inspiration. 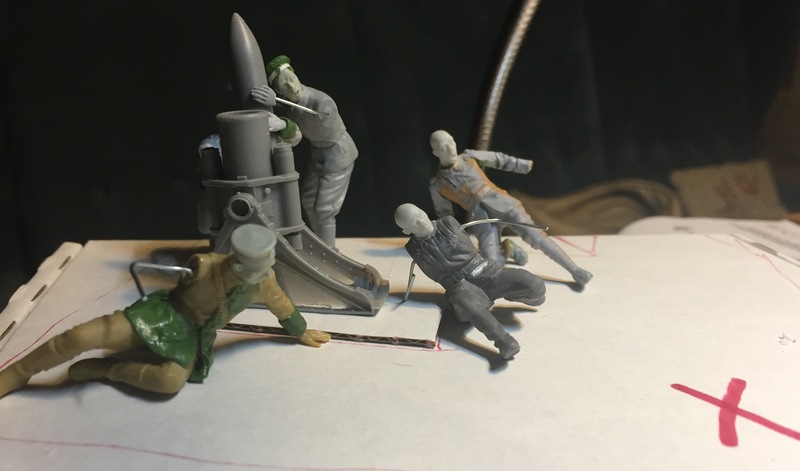 Very much looking forward to seeing how you do the groundwork, and many thanks for sharing the in progress photos. Thank you very much Juan, Dave, Manni, Nigel and Edo! 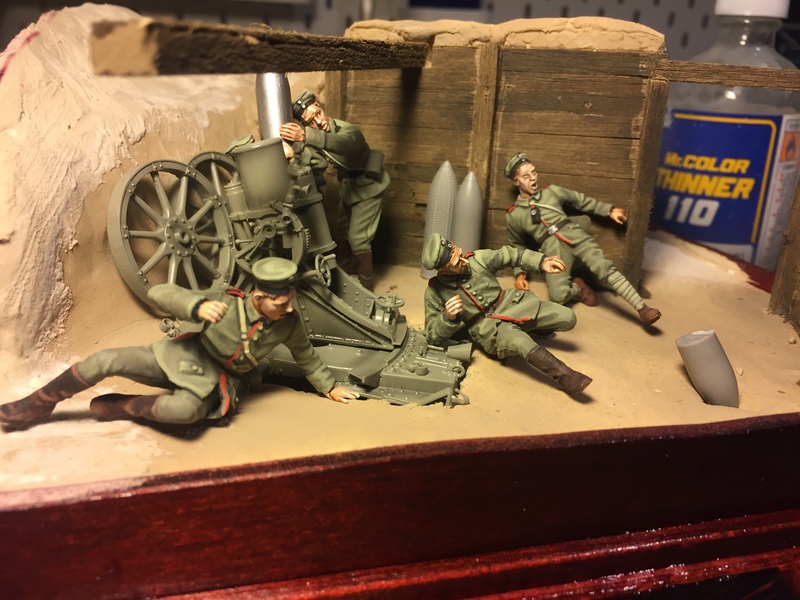 It’s been quite a while since I started this project but meanwhile it is finally finished. 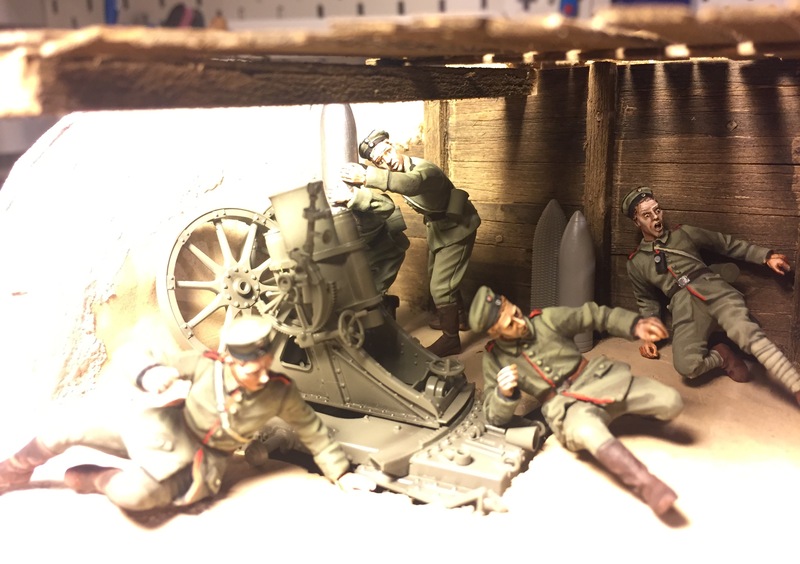 It was my first attempt at building a covered trench. 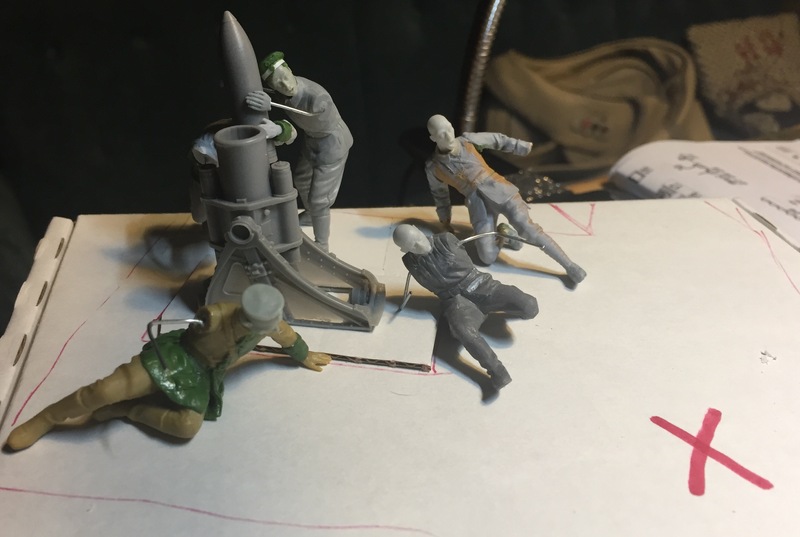 The CMK Minenwerfer is a pure joy to build and they released meanwhile its little 7.58 cm brother. 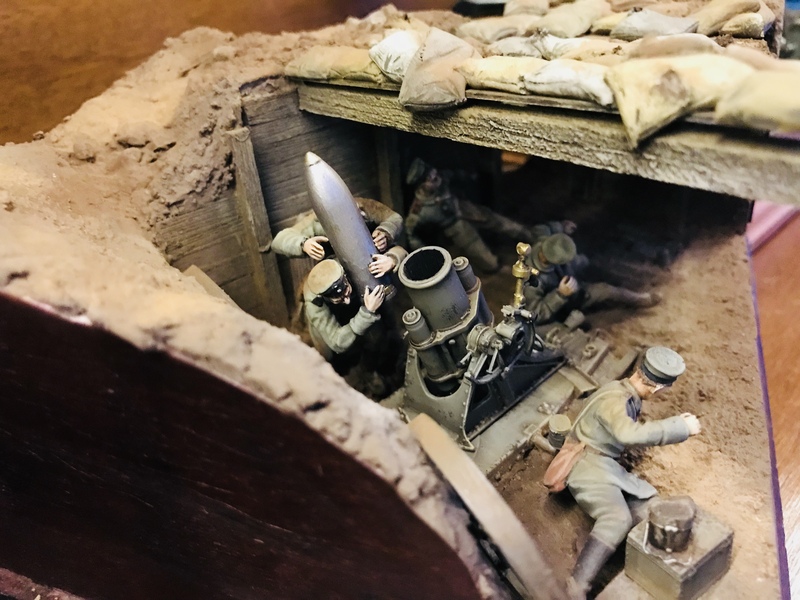 In this context I am really very grateful for the help of Dave W, who sent me very interesting pictures of a surviving example of the 25cm Minenwerfer in Australia. He did so although he must be more than busy running this site which makes this friendly gesture still more kind. Thank you a lot Dave! Andreas, this is simply amazing! You wonderfully captured the drama of the scene... everything is spot on: the sculpting, the painting... perfect! Great scene! Very interesting display and so much action. Just perfect. The figures are really painted outstanding, you can feel the terror of the shell when you look at their faces. Prachtvoll!! Truly 3-dimensional art, especially the photo with the interior lit by the light coming through the spaces in the overhead. . .
Hoffentlich war die allierte Patrone Verraeter!! Tank you very much for your kind words, Edo, Manni and Rob! Overall this is well build and painted by a great master!